This is my last post before Christmas, so here's wishing everybody a brilliant Christmas and even better new years. For those of you who, for whatever reason, do not do the Christmas thing, here's wishing you all the best in the holiday season anyway. All I have left to do now is to get the turkey and beer in. Pretty much everything else is done. Till the new year - 2010 (seems weird typing it). Finally, the sideboards are up and painted. Here you see Fred relaxing in the watery winter sunlight after giving the final sideboards a first coat of paint. I suspect we will have to slap on another coat of paint before I can say that this phase of the job is complete. Next will be to build a hatch cover, then cleanup and paint the deckhead. 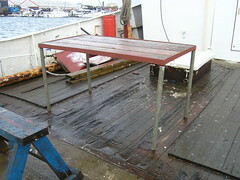 I suspect we will also need to put some insulation into the deckhead, to prevent condensation raining down on us. Only once the insulation has been done can I then think about lighting. What initially seemed to be a quick, straightforward job back in August has turned into a bit of a marathon effort. Now here's something I think is really fun. I love things that work, whatever they are. Usually, the bigger the better, though this tiny Honda engine is an exception. 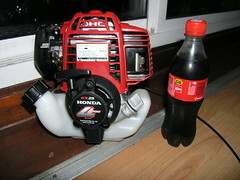 It's an amazing 25cc four stroke engine, weighing almost nothing, but producing one horespower (0.72 kW). My plan for this little beauty is to connect it up to an alternator and produce 24V to charge my battery bank when the wind's not blowing. By producing 24V directly from an alternator, I maximise the efficiency of producing power. This engine should be able to top up my battery bank using a fraction of the fuel any of my other mains generators would do. 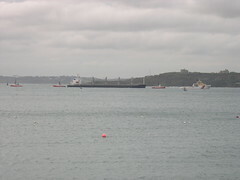 We watched the coastguard ship you see on the right there leave Falmouth in the afternoon. The next morning, we watched her towing this huge ship in. There were, in total, four tugs bustling about, ready to take the ship under control as it entered port. I presume that this sea rescue service would cost the owners a pretty bundle though. 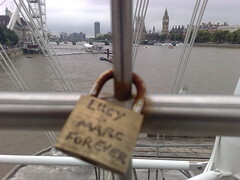 I saw this while on a recent visit to London. I thought it was a rather cute and original idea. Still no progress on the boat, for all kinds of reasons. 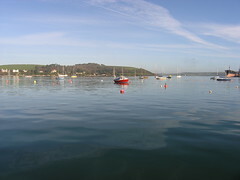 This was taken in Falmouth. Moving into the new workshop space has meant the workbench has to be pressed into service on deck as a work table. I can't, for the life of me, find the original set of four scaffold pole legs, so have had to resort to the longer legs I sometimes use. The 'right' legs were originally cut so the workbench was at the same height as the other table and saw horse, making cutting large plywood boards easier. 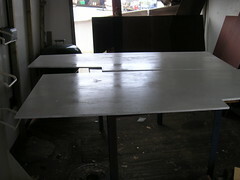 The only downside of using the workbench like this is the danger of cutting into the steel edges with the circular saw. Something I've already inadvertently done with the new table. I have absolutely no desire at all to find out what happens to a circular saw blade when, at full speed, it tries to cut into steel. 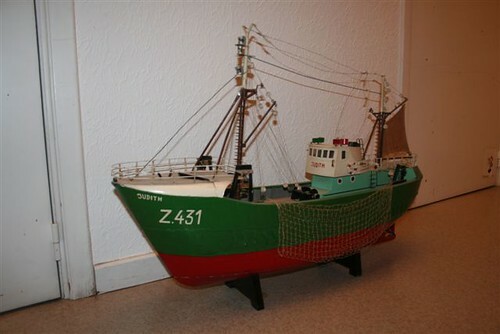 I found your blog surfing the net and was surprised to find the boat that has been standing on my mantelshelf for the last 45 years or so. I think you will like the pictures below. The maquette is about 90 cm long, 62 cm high and 20 cm wide. Luc is from Belgium, where Lady Jane was built. I've never heard of a maquette before, but the word is just perfect. From the pictures Luc has sent me, I see all kinds of detail about Lady Jane on the model that would otherwise have been lost forever. For example the hand rails and the way the winches were setup. Those colours are also Lady Jane's original colours. Lady Jane was called Judith, and her number was Z431. 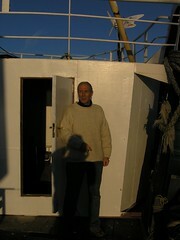 Judith was built in 1963, so Luc must have got that model when Lady Jane was nearly new, if not brand new. Sadly his parents cannot remember where they got the model as a present for Luc all that time ago. Some things are just so unreal, you couldn't make them up if you tried. This recent bought of wet, windy weather has played havoc with any plans to get things done on Lady Jane. What has now effectively been four weekends washed out has obviously also impacted on the blog, so sorry to one and all for that. The picture you see is the last two boards to go up on the sides of the workshop space. Oddly enough, Fred and I were working out on deck in a freezing wind before I realised we could just as easily work in the new workshop space and not suffer. What I now need is a dry spell, so I can get those last boards on and painted.